Back when I was getting really interested in Ancient Egypt for the first time, Joann Fletcher was making headlines for her "discovery" of Nefertiti's mummy. Her so-called discovery was deeply controversial, the evidence used appeared unconvincing, inconclusive and largely circumstantial – even to a lay teenager's eyes – and Fletcher caught a lot of flack for her claims, even being banned from working in Egypt at one point. Even to this day, over ten years on, the controversy around this incident proves influential in how I view Fletcher's work. Then, visiting one of my favourite bookshops and checking out the history sections for its usual sparse pickings on Ancient Egypt, I saw Joann Fletcher's The Story of Egypt on the bookshelves. It's got a pretty cover. But it's written by Fletcher and I still have a gut-reaction of "no" whenever I see her name. I do like her style of writing, though, which was one of the few positives of reading The Search for Nefertiti that I can remember. But it's another general overview of Ancient Egyptian history and I've already read and loved two great books that cover the same span of time, which is the prehistory origins of Ancient Egyptian civilisation to the death of Cleopatra and the fall of Egypt into Roman hands.I ended up flicking through the index and decided, what the hell, I'll get it and give it a go. It could be interesting to read Fletcher's take on Nefertiti years after the controversy. I really do enjoy Fletcher's style of writing. It allows for her to appear knowledgeable about her subject, lets the book be accessible and clear, but there's this almost casual edge to it that makes the history come alive. I could sometimes hear her voice in my head as I read, which made the reading process even more enjoyable. It's that sort of writing that makes a vivid impression and allows for an unfamiliar audience to quickly connect with an alien culture.On the whole, too, I found Fletcher's depiction of Ancient Egyptian society to be solid but also refreshing. She provides some fresh takes on Ancient Egyptian culture, particularly on the role of women, which are fascinating and offer great food for thought in any attempt to reconstruct the life and culture of the Ancient Egyptians. There were a few little snags in my enjoyment. Fletcher too often describes things as "so-called", which did get a tiring after awhile. It's not that the phrase was used incorrectly, just the frequency of its use was wearying. The structure of the book is chronological, which is logical and it does flow reasonably well, but there are time when I thought that a slightly less rigid adherence to the chronology might be more practical. For example, I personally find it more logical to talk about the (re)burials and mummies of the Amarna personages in Chapter 17, which is where Fletcher details the Amarna Period, but Fletcher chooses to have that discussion two chapters on, when she's talking about the decline of the Egyptian empire some years on, connecting it to the government-sponsored systematic looting of the Valley of the Kings and the resulting cache burials.The biggest flaw in The Story of Egypt is, in my opinion, is how Fletcher approaches the topic of Nefertiti. There seems to be a few Egyptologists who are too close to Nefertiti (or to their idea of Nefertiti) in order to be objective about her (I've been attempting to come up with a phrase for this – perhaps "Nefertiti devotee blindness"?) and sadly but unsurprisingly, Fletcher seems to be one of them. Ultimately, it was far more enjoyable and less frustrating to tune out whenever Fletcher started discussing Nefertiti than it was to start unpacking what she was saying and why it wasn't right. I will, however, provide examples. Fletcher reiterates her claim that the mummy designated KV35YL is Nefertiti, offering much the same evidence as she did when she first announced her claim. The most convincing, of course, is the claim that the facial measurements of the mummy and the Nefertiti bust "accord, within a millimetre" – but of course, Ancient Egyptian statuary was very rarely true to life.She also claims that KV35YL had her "right arm, once bent across her chest to hold a sceptre in the pose of a ruling pharaoh". Except – KV35YL's right arm is missing, torn away near the shoulder, so it's impossible to know how her arm was positioned. Her left arm lies flat, her hand on her thigh, which would rather rule out the idea that she was buried as a pharaoh, with both arms folded cross her chest. Fletcher did find a single mummified right arm in the chamber in which KV35YL was buried, but DNA testing (unmentioned by Fletcher) that the arm belonged to a man, making it very unlikely to have been Nefertiti's or KV35YL, who was confirmed as female in the 2010 DNA tests. At any rate, a single bent arm is not the marker of a pharaoh, who would be buried with arms folded across their chest. It is possibly the marker of a queen, but the significance of a single bent arm is unknown. In one word, the claim that KV35YL's bent right arm shows her as a pharaoh is balderdash. She doesn't have that arm. Fletcher likewise ignores the 2010 DNA testing of the "Tutankhamun kindred" that revealed KV35YL was the daughter of Amenhotep III and Tiye, unlikely to be Nefertiti (who never used the titles "King's Daughter" or "King's Sister" that she would have been entitled to). Personally, I don't expect Egyptologists to universally conform to those findings. Off-hand, I can name four authors, three of whom are trained and highly credible Egyptologists, who have cast doubt over the DNA testing, some who dismiss it outright while others offer up new interpretations. I do, however, expect for an author to address the DNA testings, even if it is to cast doubt and ultimately ignore them. It was a huge news story at the time and, for many, settled the question of "is KV35YL possibly Nefertiti" with a "no". It is a development that should have been mentioned, only if to be argued against and dismissed, and the fact that Fletcher doesn't automatically and significantly weakens her arguments.While discussing Ancient Egypt's last native female pharaoh, Tausert (or Tawosret, one of many variations of her name), Fletcher suggests that she may have been a descendent of Nefertiti and modelled herself after her in some regards. But Fletcher offers nothing but shaky arguments to support it, namely the finds in Tomb 56 of the Valley of the Kings (KV56). It has been suggested, but not proven, that KV56 was begun in the Amarna period for an unknown individual, but Fletcher assigns ownership of it to Nefertiti, and dismisses the commonly accepted theory that KV56 was used for the burial of a child of Seti II and Tausert. Instead, Fletcher suggests that the jewellery was a votive offering to Nefertiti, possibly because Tausert was her descendant and neatly avoids addressing the question I have: why on earth would they pay homage to someone so closely connected to the reviled Amarna period and Akhenaten, the "Great Criminal", even if they were related? I won't go any further in this discussion of Nefertiti, namely because if I do, I'll be here for a very long time and be tempted just to start shouting questions at the book. That said, Fletcher's approach to Nefertiti did bring down the book for me and definitely soured my enjoyment. It also makes it difficult for me to recommend it to those wanting a good overview of Ancient Egyptian society. I could only recommend this book with the caveat of "take everything said about Nefertiti and related subjects with a pillar of salt", whereas I don't have any similar qualms to recommending Toby Wilkinson's The Rise and Fall of Ancient Egypt or Barbara Mertz's Temples, Tombs & Hieroglyphs, both of which are excellent (and in Mertz's case, amusing) overviews of Ancient Egyptian civilisation. At the end of the day, I'm glad I satisfied my curiosity about The Story of Egypt. For the most part, it is an enjoyable read and I loved some of the new ideas Fletcher highlighted in her work. I am certainly less hesitant to pick up any of Fletcher's other books, though I will undoubtedly find any discussion of Nefertiti frustrating.2.5 starsFor those who want a glimpse at the controversy about Fletcher's discovery of "Nefertiti's" mummy, I suggest reading Mark Rose's "Where's Nefertiti?" on Archaelogy.Org. Actually 3 1/2 stars. This book is good for a researcher or for somebody who is doing a paper in the Egyptian empire but not so good for the casual reader, or for someone who wants to know only the most popular aspects of the Egyptian history, (the scorpion king, Ramses, mummification and cleopatra and Caesar and mark anthony) , but since the writer tried to compress the whole history of the Egyptian empire in a 370 pages book, it suffers from information overload and at the same time , not enough information about key players (Ramses is only given a couple of pages, females rulers are given one page (except Hatshepsut), and the ptolemies and Alexander the Great are given just one chapter, this book is perfect for a general history research project, it doesn't make for a easy read . But if you love Egyptian history and are willing to overlook some boring genealogy trees and monuments lists , then this book is for you. “Osiris is yesterday and Ra is tomorrow, Yesterday belongs to me and I know tomorrow.” The Book of the DeadThis is a scholarly work on the history of Egypt from the early beginnings until the Kleopatra/Ptolemy dynasties. There are lots of illustrations and numerous maps and even a timeline that helps you put all the different dynasties in order. If you love Egypt and the history of the place than you will enjoy this book. If you are just a fan of the Mummy movies than this book goes in too much depth for you to enjoy it. What I learned from this book was that Egyptians allowed women to rule as Pharaoh almost from the very beginning. They had power that women today do not have. There also was slavery and a deeply religious people who relied on the Nile and its seasons to keep them alive. The majority of this history delves into the various tombs and artifacts that have been recovered for each leader. Since the libraries of Alexandria were destroyed and the Egyptian people didn’t write too much down, but decorated the tombs with hieroglyphics that help us to better understand them. I found this book very interesting and revealing as I knew little about Egypt before reading this history. It was a fascinating story of men and women carving out a civilization in the ancient era. I received this book as part of the Goodreads First Reads program for an honest review. Hmmm. Well, this would have been more enjoyable if Egypt had less history. Fletcher's book covers roughly 4,000 years of Egyptian history, and she makes a noble effort to keep things lively, including all the lurid details she's got on the salacious, murderous (and sometimes salaciously murderous) lives of Egypt's rulers, not to mention the gory details of battles and how body counts were kept, gods and their sacrifices, pharaohs and their sacrifices (one interesting thing I did learn was that the early pharaohs liked to be prepared, and took plenty of courtiers with them to the next life – I hadn't realized this! ), etc. Plenty of court gossip, which can be fun. In moderation, that is. Which is sort of the problem. While she ventures a little into Egyptian religion, for the most part this is a history of rulers, and four thousand years of rulers, most of whom are named Amenemhat, Neferkare, Ramesses, or Artaxerxes, finishing off with a bunch of Ptolemys and Cleopatras, gets... dull. Try as she might, each of these rulers sounds a whole lot like the next. Every so often there would be some ruler or event or tourist (Herodotus!) that stood out because I'd heard of them elsewhere, but often this tended to blur into a litany of names and dates. I think I'd have enjoyed it more as a physical book – I know I'd have liked to have maps, which I think are in the book, and there were probably pictures of coins and art too, which would have added interest – than as an audio, though the reader (Kate Reading) is excellent. I give this 3 ½ stars, rounding up to 4. *Short review for now*From its beginnings to the end of its tumultuous queen Cleopatra - Dr. Fletcher, brings this fascinating history to you.I could not put this book down! From a lover of Egyptian history, there were so many things that I had forgotten, or simply had not heard before (especially in some of the earlier times) that I was hooked from the start. Going down the list chronologically, you get an idea and sense of the pride, wealthy, and the not so lucky pharaohs who ruled. Each monarch's history is given, as much as can be within the space of one book, but you walk away with a complete feeling, not lacking in anyway. While some of the histories can be drawn together, and the tapestry of the genealogy can be somewhat messy, Dr. Fletcher easily navigates the murky waters.Highly recommend this book for anyone interested in history. Be sure to plan time to sit - this is not a fast read! If you were really going to study the history of Egypt, this would likely be an ideal desk reference. As recreational reading, not so much, until Alexander the Great shows up. My question: it is often stated that the Egyptians were obsessed with the afterlife. Is that only how it appears to us as we sift through the leaving? My personal expectations were perhaps too high. I rated this book three stars because there is a lot of good writing and compelling information, but it lacks some important - fundamental I daresay - aspects of ancient Egypt culture.The positive points include a rich description of the lives of almost all the kings and pharaoh of Egypt, with a final list of names at the end of the books that help to locate historically each monarch and each dynasty. Fletcher highlights the importance of women and of religious aspects in the lives of Egyptians. Detailed information about tombs, locations, arrangements, are also reported. Overall, the story follows the line of the kings and queens, with the addition of the most important military personnel and courtiers. The pictures, divided in two sets amidst the book, help to enrich the tale. The negatives: too detailed information about tombs and funerary arrangements of each king, especially in the first part of the book, are interesting at the beginning, but in the long run they become boring. The scheme followed seems to be "new king > name, wives, sons & daughter > building of his tomb > full description of his tomb (where, when, why, who build it, etc.> new king", with very little additional information about the country. This is, in my humble opinion as reader, the weakest part of the opera. Egypt's hundreds of pharaohs list started to seem a boring sequence of names with nothing worth besides. In addition, mummification and hieroglyphs are two characteristic aspects of Egypt, but no serious attempt at describing them has been made. I did not want to read a manual of mummification, but I found only sparse information about the practice have been reported and I expected more. Mummification rises suddenly in the tale without the right in-depth required. The same is true for the writing: no one wants a dictionary or a sequence of symbols with the related meaning, but in a book such as this, one must supply more about the subject. In conclusion, I liked it, because is an attempt to report more than 3 thousand years of glorious history. The book is updated, and generally well written and interesting. It lacks a conclusion to say the truth: the tale stops suddenly with the death of Kleopatra. Given the long travel (again, 3 thousand years) and the personal link of the author with Egypt, I expected final considerations of a certain importance. The most interesting parts are those in which Fletcher leaves the deeds of everyday kings and queens to look at the grander picture, that of the Ancient World of which Egypt was part. So, the diplomatic relationships with Hittites, Greece, Babylonia, Persia, Rome, Nubia, Lybia etc., the economic and financial aspect of the reign, the wars of conquest, the guiding figure of the some of the greatest Pharaohs, the contrasts with the Amen clergy. When the look is widened, the book breaths real life, become dynamic, gives the sense of real history and is really interesting. To help the reader two detailed maps at the beginning of the book and a satisfying Index at the end of it. This is a difficult book to evaluate. For one thing, Fletcher packs so much into 400+ pages. I have probably learned more about Egypt reading this book than any other book on the subject, or an accumulation of books and college coursework. On the other hand, I felt that she was working too hard to fit all of the pieces together, something like Simcha Jacobovici. Similar to Jacobovici, Fletcher overwhelms readers with data and information. I like the way that the book is basically organized to chronologically discuss each dynasty culminating with the death of Kleopatra VII in 30 BC. For the first time I realized that each dynasty did not control all of Egypt, but frequently only parts. Some dynasties were single ruler - warlords who carved a territory out of something, authority resting on preserving the ancient pharonic line. For most of the chapters, Fletcher refers to archaeological data. She is a bit too cursory when discussing pre-dynastic Egypt and the Old Kingdom. This is not due to a lack of material, as excellent books have been written on the topic. Her focus is on the Middle and New Kingdoms where her passion truly lies and where readers may become uneasy with the book.I do not have the expertise to focus on specific data. However, the book reads like a strenuous effort to identify female pharaohs and possibly Jewish pharaohs. This small bias becomes apparent in the Middle Kingdom when she tries to identify feminine aspects on male pharaohs and masculine aspects on queen consorts. This naturally drifts off into her identifying partial mummies - seemingly randomly - as pharaohs, queens, princes, and princesses. At some point in her discussion on the Middle Kingdom, Fletcher begins making leaps in logic and evidence. Ultimately, I appreciated one of her underlying theories - that the steady growth in power and wealth concentration among the high priest of Luxor-Thebes led to a power rival against the pharaoh, a rivalry that led to civil war and resulted in foreigners dismantling the empire and even occupying parts of Egypt. Her emphasis that the Hyksos were more likely peaceful colonists from Palestine and Semitic in origin is another example of her seeming desire to establish them as Jews, or at least proto-Jewish. Is there such a thing as Proto-Jewish? Nevertheless, the conflict between the pharaohs and the high priest of Thebes (every Egyptian proper noun has at least five names) permanently weakened Egypt and allowed a slow and steady decline. I am happy to recommend the book. While Fletcher does support some questionable theories and interpretations, overall, I feel that her work is mostly easy to read. The book starts off slowly; but quickly improves readability when she begins to describe gender-confused pharaohs. Then, if readers rather ignore the allusions to gender confusion, they can learn something. And maybe Fletcher is accurate when she identifies female pharaohs. 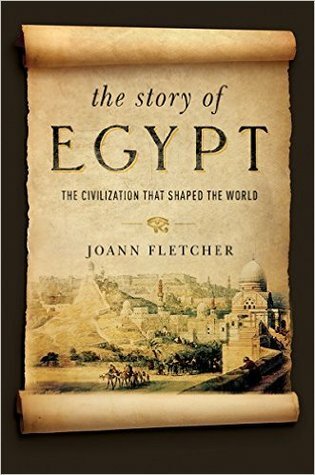 I first came across Joann Fletcher on TV, where she is an engaging presenter, often offering a slightly different view on events in Egyptian history. So I was perhaps expecting too much when I picked up this book, thinking that it might have the same style.It is a very competent and comprehensive history of the Pharaohs and Dynasties of Egypt from about 5500BC up to 30BC, when it became a Roman province. I suspect that most of what we currently know about the 'King List' is here in as much detail as we have (although I am aware that one or two of the author's views are controversial). We get Pharaoh after Pharaoh, how they were related (or not), what they built, how and where they were buried. We also get other details of life at the time, but only really in as much as they relate to the royal family; and this is what let the book down for me. It certainly isn't a story of the Egyptian people and way of life; it should perhaps be called 'The Story of Egypt's Rulers'. If you know little about Egypt, then this might be a good starting point to get your bearings, and understand the dynastic chronology (although it can be a bit monotonous at times); if you already have some understanding of that, then this book probably won't add much. This is a wonderful book! I listened to the audio book, which I highly recommend, if you struggle with Egyptian names and pronunciations. It is extremely detailed, and the author does speak about every pharaoh throughout the history of Egypt, with the exception of the intermediate periods where the country descended into chaos. I found it to be extremely compelling, and gained such respect for an incredible world power that was sustained for over 3000 years. I visited Egypt recently and this was a wonderful follow up to help fill in the gaps in my understanding of the history pertaining to the many archaeological sites I witnessed while there. This book is not for someone with a passing interest in Egypt. If this culture and history in general fascinates you, then you will likely enjoy this book. Many disparage Egyptian history as simply a list of kings and how they were buried. Modern histories have escaped this and even the general surveys have written about the lives of the masses, and the Eqyptian culture. The author, abandons this approach and in turged prose, lists kings with their tombs. She does take us past the Ramasies, which many do not, but history is lost in the telling. She also in numours cases takes relationships, identifications, and locatons still under achidemic debate, and simply states her belief as fact with out mentioning the debate. While in many cases I agree with the author, does not make this a good practice. I recommned that even the die hard arm chair Egpytologests, as am I, to avoide this tome. This book really doesn't accomplish what it's title would imply. The first three quarters of this book could really be titled "Ancient Egyptian burial practices" and be more accurate than the current title. The last quarter does begin to tell a story, it is too little too late to help the overall narrative. Fletcher's passion for her subject does come through, but she fails to bring the material to life, or to convey any sort of story. In no way does this book communicate how Egypt shaped civilization, whether contemporary of modern civilizations. While not a bad book, with plenty of good material on ancient Egypt, it competently fails to follow through on the promises it makes. This is why it earns two starts from me. This book starts and ends well, beginning with an explanation of the formation of Egypt that deftly weaves archeology and myth to explain much of what Egyptian culture would become, closing with a nimble telling of the twisted Ptolemaic dynasty. It's what lies between that is mostly the problem, since the author mostly sticks to her chronological political history, determined to mention every single Pharoah regardless of whether she has anything to say about him. That's too bad, because when she's on a topic she enjoys, such as any female pharoah or the height of the Middle Kingdom, she really shines. Unfortunately 4000 years leaves a lot of room for filler. Pretty boring but a nice overview - it's hard to get into this book since the scope of the history covered is so broad - which means top-level info is prioritized over interesting tid-bits and specifics. Additionally, up until Herodutus and Alexander the Great come on the scene (at which point the narration finally feels like story-telling) everything is told like a series of facts based on how people were buried and what they were buried with. No real picture of life in the times and lack of detail on the few/key interesting cornerstones of egyptian history make this a somewhat educational read, but too boring to likely remember anything. 2 1/2 stars rather than 2. I really, really wanted to enjoy this book but having ploughed through it I was left rather disappointed. Not so much the story of Egypt rather it ends up as a catalogue of the Pharoahs and the tombs that they built with the wider history being only alluded to or mentioned in passing. We don't learn an awful lot about the Egyptian people or the society in which they lived over the millennia covered. Perhaps I was expecting too much from a 350 page book and Joann Fletcher has been very ambitious in trying to cover such a vast period in one go. I don't think she succeeds particularly well. I learned SO MUCH! Egypt and her history have always fascinated me. We all know these guys taught us so much and were doing things so far in advance than the rest of the world but I just didn't realize they had the number on oh so many more things than I thought I knew about. Honestly the corruption for power was something to behold as well but how on earth do you get away with it for centuries upon centuries? It's a crazy thing to ponder especially with all the inbreeding again for centuries and centuries. I love reading about it though. Not what I expected - yes, a lot of interesting tidbits about Egypt's Pharaohs (both men and more women than previously thought) however no information about life in Egypt, about mythology and beliefs, interaction with different cultures, etc. I don't know what I expected from this book, but it got pretty dull from the middle onwards when I realized it was literally just a list of kings naming their greatest building achievements and listing their successors etc etc etc etc etc. Based on the best new research, the first 2/3rds are valuable although a more accurate title would have been "The Story of Egypt's Pharaohs" since the common people hardly make more than the briefest appearance. Moved from 4 stars to 3 due to the sheer tedium of the last section dealing with the Ptolemys, but likely it's impossible to make that weird story interesting. I am interested in ancient Egyptian history but - as I found out at about 30% on my Kindle - not quite to the extent provided by this book which concentrates mainly on the long, long list of rulers, tombs and temples.I already know that I won't be able to remember even a fraction of what I have been reading. A great narrative historyThe most encyclopedic and up to date history of pre-Roman Egypt I have found. It tells the story of the country from its earliest beginnings to its seizure by Octavian with full regard to the latest scholarship and lays to rest many of the misconceptions and biases of the last two hundred years. It's also a great read. Well not so much the story of Egypt (a 5th century BCE Greek name) as the story of its rulers and their tombs. Of course there may not be much more than the tombs as evidence, and the information from that source is well presented and well written and interesting. An amazing trip through Egypt, from prehistory to the end of the Ptolemaic dynasty. Fletcher also addresses some of the problems inherent in early discoveries and assumptions about the gender of some pharaohs, all with a delightful dryness. Absolutely incredible overview of Ancient Egypt from the earliest human presence to the dramatic death of Kleopatra VII. Some incredible anecdotes in there reminiscent of some of the most shocking moments of Game of Thrones. Well worth the read. Mixed bag here, some interesting things I didn’t know before but much supposition and repetition of who built what and how they were buried. Joann Fletcher made Egypt come to life off the page. It was a very fascinating read. Thorough and interesting. I learned the first sit-in strike in recorded history was tomb builders 1300 BC who sat all day because they were not being paid/fed. There seems to have been just too much ground to cover in too few pages. I couldn't get a handle on anyone or any themes or really anything--it was like watching a film running at 4X speed!--which I found very frustrating.